For most people, the experience of being engulfed by a cloud of cigarette smoke has been greatly reduced with the widespread enactment of smoke-free laws governing workplaces, recreation spaces and other public gathering spots. Until recently, however, millions of Americans living in public housing—particularly children—were unable to escape the damaging and often deadly effects of a smoke-filled environment. 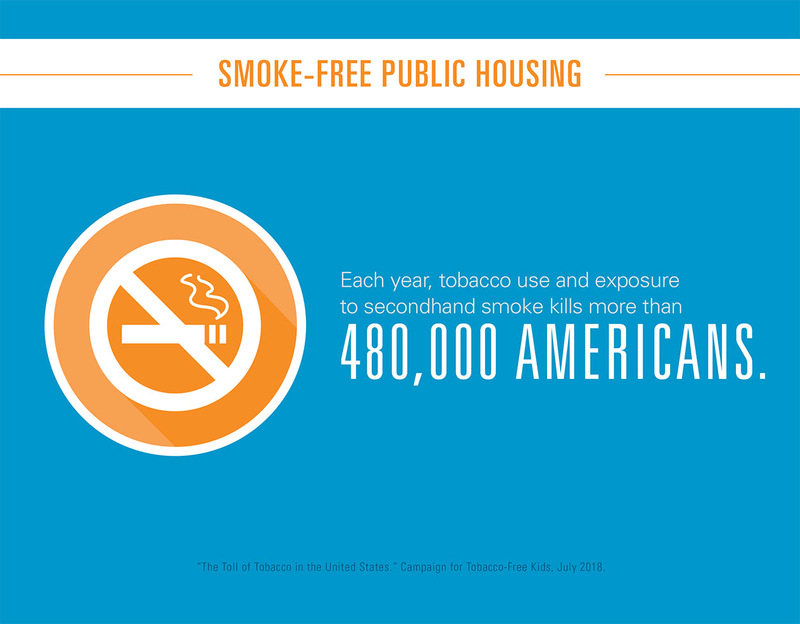 In an effort to reduce tobacco use and the impact of secondhand smoke on its residents, the U.S. Department of Housing and Urban Development (HUD) announced in 2016 a nationwide smoking ban in public housing. The smoke-free policy, which took effect on July 31, 2018, prohibits smoking in all living units, common indoor and outdoor areas and administrative buildings, and recommended that local public housing agencies provide smoking cessation services to residents. Tobacco use is the nation’s number one preventable cause of death, killing nearly half a million Americans and costing about $170 billion in direct medical spending each year. 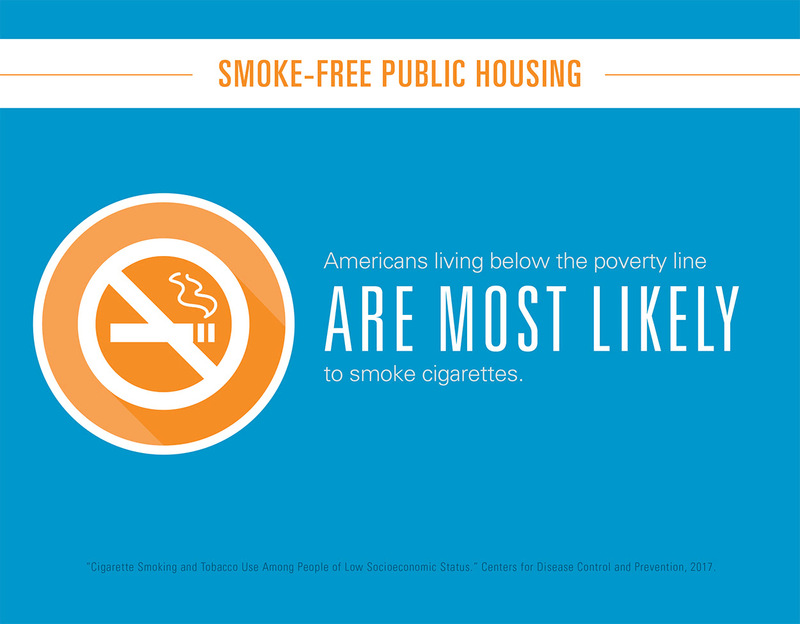 Secondhand smoke sickens and kills even those who have never picked up cigarette and low-income residents in apartments or condos are at an increased risk of exposure due to the higher prevalence of tobacco use among the poor. The harm is particularly acute among children. According to the CDC, children who live in multi-unit housing have 45 percent higher levels of cotinine – the byproduct created when the body breaks down nicotine – than children living in single-family homes. Infants exposed to secondhand smoke get sick more often, have an increased risk for respiratory and ear infections and experience more severe asthma attacks. Additionally, approximately 7,330 deaths from lung cancer and 33,950 deaths from heart disease are the result of exposure to secondhand smoke each year. 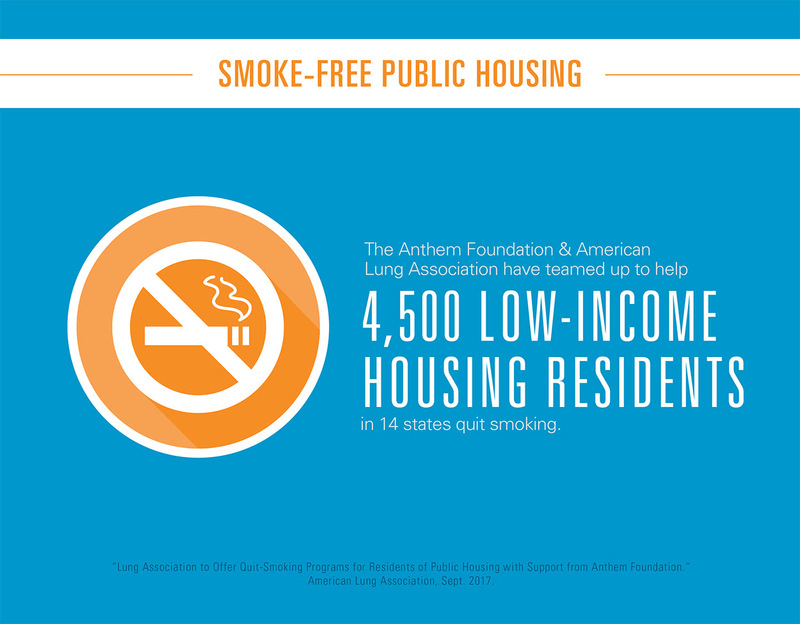 To reduce the toll of tobacco on residents of low-income housing, the Anthem Foundation and its long-time partner the American Lung Association, along with 200 community partners, joined together to bring public housing residents access to proven techniques for quitting smoking. 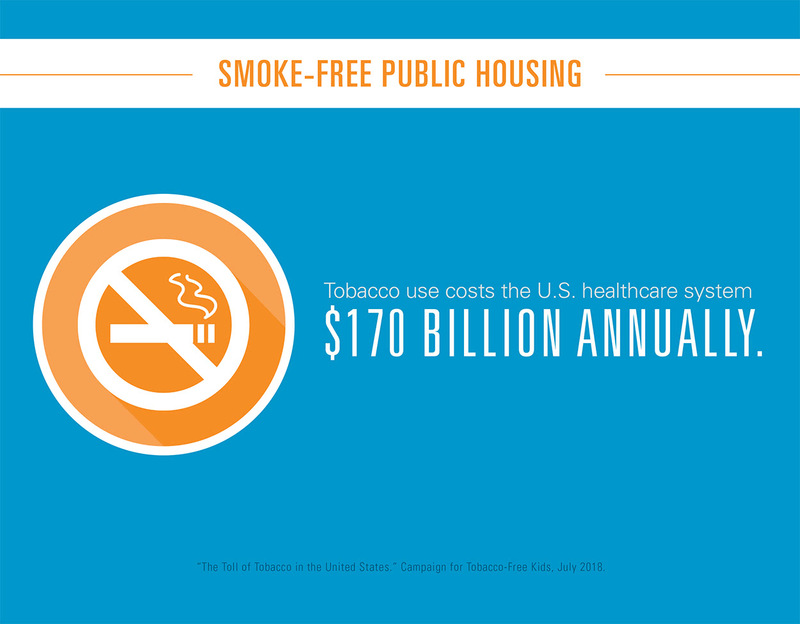 With nearly $1 million in funding over two years, public housing residents in 14 states will receive smoking-cessation services. The program, which is expected to help 4,500 residents quit smoking by the end of June 2019, has already reached more than 19 percent of its goal as of January 2019. Introduced before the HUD smoke-free policy was fully implemented, the Smoking Cessation for Low-Income Housing Residents Initiative leveraged the ALA’s expertise, resources and support to provide Public Housing Agency staff and other local partners with training on how to administer ALA’s Freedom from Smoking evidence-based cessation treatments, which has already helped more than 1 million individuals quit smoking. In addition, the program offers residents free services including counseling on building a quit plan, cessation treatments, motivational and community support for managing stress and overcoming relapse, as well as access to 24-hour online and telephone resources. *Contributing to the initiative were Anthem’s affiliated foundations, including Anthem Blue Cross and Blue Shield Foundation, Blue Cross Blue Shield of Georgia Foundation and Empire Blue Cross Blue Shield Foundation.